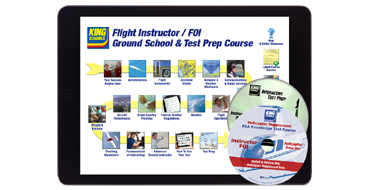 The Flight Instructor/FOI Helicopter Supplement Course On-Disc for Windows PC works in conjunction with the Online KING Flight Instructor/FOI Helicopter Ground School & Test Prep Course. Together they cover everything you need to ace your Helicopter CFI Written Exam (Knowledge Test), including all helicopter CFI test areas and all available FAA helicopter CFI questions, answers and detailed explanations. Helicopter CFIs—if you are tired of taking online FIRCs made for airplane CFIs, you now have an option that is relevant, engaging and insightful. For details ... click here.